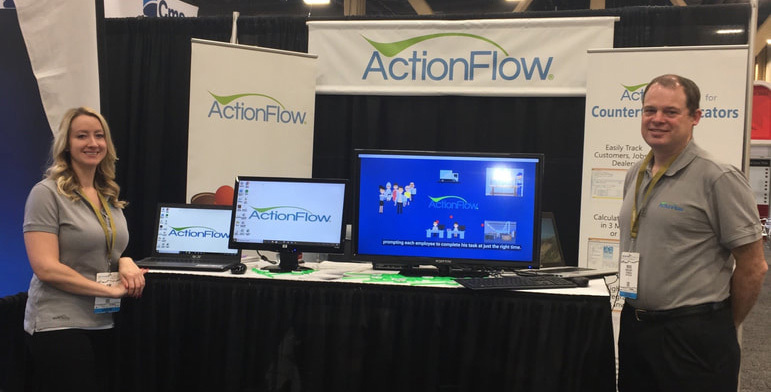 ACTION FLOW, St. Louis, offers the ActionFlow® software for countertop-shop workflow and management. The software is designed around the concept of a process automation engine - it logically moves through a job from quote to installation, and prompts users for the exact information at the exact time it's needed. It also keeps track of inventory, provides work schedules and holds all data safely in the Microsoft Azure cloud. ActionFlow keeps track of what's available as far as slabs (and remnants) and can assign pricing -- not only for standard square-feet measurements, but also for custom requirements. ActionFlow estimates can be customized to include details on material alternatives as well as job size and procedures, like tearout. Quote layouts in ActionFlow allow for placement of parts on slabs and still keep track of job revenue for the shop -- including margin percentages. Integrating the backshop work with bookeeping is as easy as merging ActionFlow data into the popular QuickBooks software. Learn Much, Much More at TISE on Jan. 23-25! See us in Booth 3886.